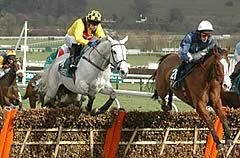 Paddy makes the seven-year-old 16-1 for Cheltenham Gold Cup glory in 2011. Paul Nolan has decided to miss Cheltenham with Irish Hennessy hero Joncol , who was a 6-1 chance with Paddy Power for the Ryanair Chase, and instead aim him at the Guinness Gold Cup at Punchestown. The seven-year-old, who was today introduced by Paddy as a 16-1 shot for the 2011 Cheltenham Gold Cup, was a revelation when proving a neck too powerful for Cooldine at Leopardstown last time, but is not among the horses going forward for the Ryanair Chase after today’s forfeits stage. Nolan had indicated that he was a ‘50-50′ chance to line up at Prestbury Park after the Leopardstown success. Andy Stewart’s Poquelin is 4-1 favourite for the Ryanair with Paddy. Meanwhile Nolan is unlikely to give Shinrock Paddy, who is a 6-1 co second favourite with Paddy for the Albert Bartlett Novices’ Hurdle, another outing before Cheltenham. Shinrock Paddy is a 16-1 shout with Paddy for the Neptune Investment Management.